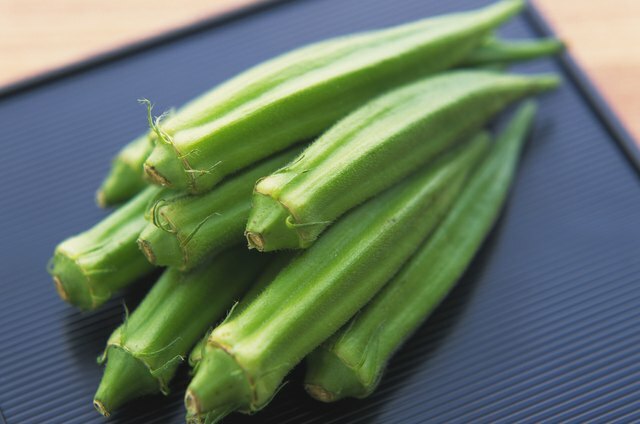 Okra, with its odd shape and hard ridges, is beloved by some and abhorred by many as it produces a slime when cut or cooked, which many find off-putting. Pair this along with its intermittent availability and more often than not, you'll find yourself searching for an okra substitute. What you choose depends on how you were planning to cook or use the okra. When cut and cooked, okra produces a slimy gel that helps thicken liquids, most notably Louisiana gumbo. Okra in gumbo is such a distinctive ingredient that when gumbos are made with okra, they are known solely as “okra gumbo,” regardless of the presence of other ingredients. 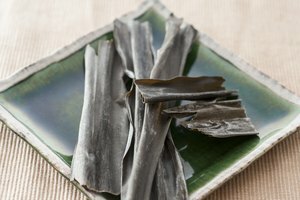 File powder -- dried sassafras leaves that have been ground into a fine powder -- can be used in place of okra to thicken gumbo. 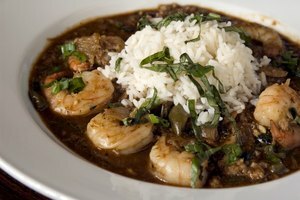 However, it adds a flavor similar to root beer to the gumbo. While some like this, it is off-putting to others. If you do not have file powder available, cornstarch or flour can be used in place of okra as a thickener. Okra boosts substance in soups and stews, where its primary function is as a vegetable, not a thickener -- for example, a fast gravy such as tomato, onion and okra gravy served on buttermilk biscuits. To reproduce the taste and appearance of okra in soups or stews, add large pieces of zucchini or eggplant. When cooked, these vegetables soften to produce a texture and taste similar to okra. Fried okra, either whole or halved, is served as a bar snack or side dish in the U.S. South. 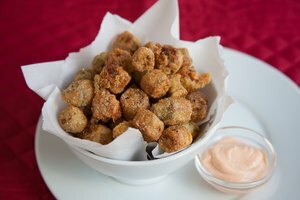 Covered with a flour or cornmeal batter, fried okra is served with a dipping sauce such as ranch dressing, and has a slightly musky taste from the okra and a crunchy exterior. Foods similar to fried okra include fried zucchini sticks, which have a similar taste and texture profile, and fried pickles, which are common as a snack in Southern cuisine. In theory, almost any green vegetable can be battered or deep-fried and served in place of okra, although eggplant, green beans and zucchini have the most similar taste. Pickled okra differs from fresh or cooked okra because the acidity in the pickling liquid reduces the amount of slime. Boil fresh okra in pickling liquid until it is cooked, then let it rest for several days in a sealed container in the fridge to make pickled okra. You can substitute sugar snap peas, green beans or sliced green tomatoes to make pickles that have the same crisp bite and snap to them as okra pickles do. For a quick, easy marinade, use leftover pickle juice from other veggies to make your pickles.